Saffron Strands: Rhubarb, rhubarb, rhubarb! When I started 'big' school, the maths teacher was less than impressed with my homework. He would show his despair at my inability to grasp calculus by writing 'rhubarb', with a furious flourish, across my pages of painfully reached conclusions. What he meant, of course, was that my work was nonsense, rubbish, worthless stuff. This slang use of the name of one of my favourite fruits/vegetables (discuss) presumably dates back to the 16th century when rhubarb was grown in the UK, not for its eating possibilities, but, as a purgative. The increasing appetite for bitter coffee led to affordable sugar in the 1700s and opened British eyes to eating rhubarb for pleasure rather than purging. By the early 19th century we had learned, by accident, how to manipulate rhubarb's growth to produce a very different food from the thick-stemmed, pink/green shafts topped by exuberant, non-edible, leaves that grew in our gardens. I've written about this before so go to Rhubarb Triangle if you want to read more. Why am I returning to the subject of rhubarb? Because of seasonality, each year in early January slim stems of soft-pink through to ruby-red 'forced' rhubarb stems briefly appear at market. And this year photographer Martin Parr has a perfectly timed exhibition at The Hepworth Wakefield gallery, part of which focuses on 'The Rhubarb Triangle'. 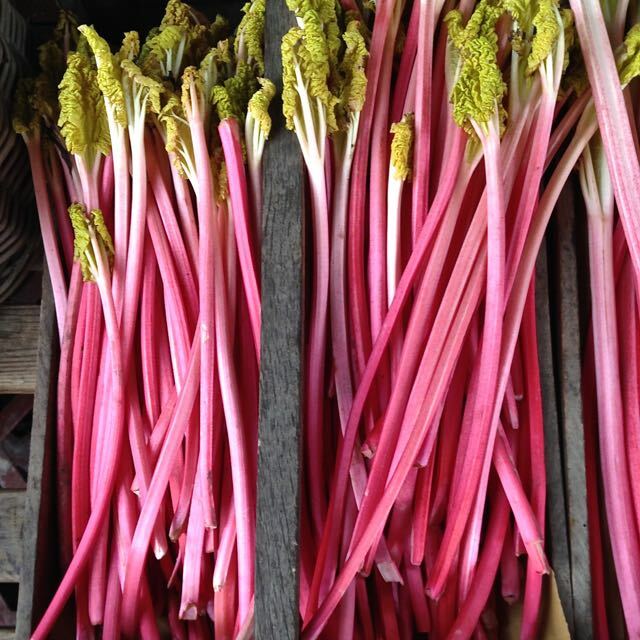 If ''Yorkshire Forced Rhubarb' is familiar to you it's likely to be for those, supermarket, small pink, plastic-wrapped, decapitated bundles or, if you're lucky, glowing sticks laid out, untrimmed, on the shelves of your greengrocer's shop. Martin Parr's 'The Rhubarb Triangle' project digs beyond the beauty of the candle-lit harvesting of the crop and its consumption. When I posted a snap of what I was seeing at the exhibition, someone commented "It looks like a horror movie." 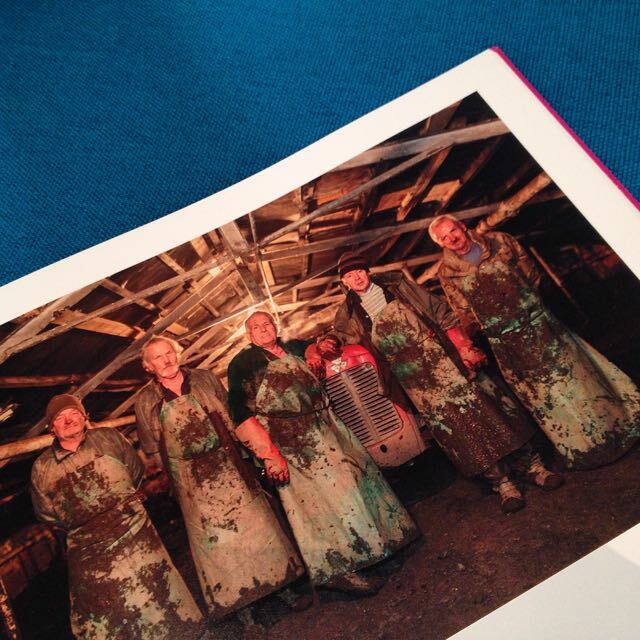 Parr's project captures the dirty, cold, labour-intensive work of moving the plants from field to shed, its back-breaking nature clearly etched on the faces of the workers in this triangle of West Yorkshire land between Wakefield, Morley and Rothwell. It's an exhibition well worth seeing, along with the fantastic permanent collection of Barbara Hepworth's work and that of her contemporaries. On my visit, a detour into Wakefield market yielded no rhubarb and in Leeds market only a few sticks of the local speciality. I hope this means that local people buy direct from the growers thereby getting the very freshest produce. I'll happily use my allotment-grown rhubarb in various ways - crumbles, cakes, muffins and jams - but for me, by far the best way to enjoy 'forced rhubarb' is simply, and gently poached. The addition of one of the following before poaching is good - a vanilla pod; a little preserved ginger; orange zest and/or juice; or a single clove. Best of all, I think, is to add a teaspoon or two of rosewater just before serving. Forced rhubarb is expensive - think of all that hard graft - particularly this winter when the necessary frosts have been few and far between. But it is special and poaching it will give you a pot to keep in the fridge to be eaten by the spoonful, with yogurt or cream perhaps. 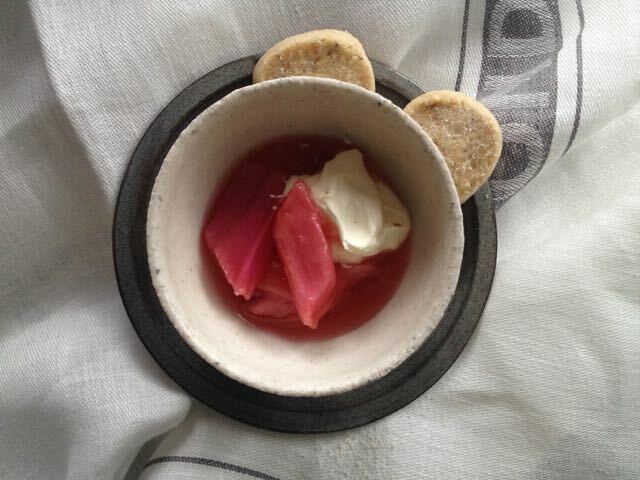 Here's how I like to poach my forced rhubarb, along with a great recipe for Hazelnut Shortbread from The Kitchen Revolution by Rosie Sykes, Polly Russell and Zoe Heron. These biscuits add an accompanying buttery crunch. Preheat the oven to 160C (140C fan). Wash and top and tail the rhubarb. Cut into 1 inch/2cm lengths. Place in an ovenproof dish. Sprinkle with the sugar (if you opt to use a flavouring other than rosewater - see above - now is the time to add it). Cover with a cap of greaseproof paper and cook for 30 minutes. If your spears are thin ones they should be soft but still holding their shape. If they are thicker then give the dish a very gently stir, replace the paper cap and cook for a further 10-15 minutes. Remove from oven and leave to cool a little. Using a slotted spoon, gently place the rhubarb in a bowl (if you have used a clove, remove it now). Pour the juice into a small heavy-based pan, bring it to the boil then simmer until the juice is reduced by half. Cool and stir the thickened juice gently into the fruit. The compote will keep, covered, in the fridge for up to a week. Grease a baking tin, approx 26 x 16 x 2cm, with butter. Cream the butter and sugar until pale and fluffy. Pulse the hazelnuts in a food processor (or bash them in a tea towel) into small pieces and add them to the butter and sugar mixture. Fold in the flour and salt to form a light crumbly mix. Press the dough evenly into the greased tin and score into fingers without cutting all the way through. Remove, dust lightly with caster sugar and allow it to cool a little before breaking the shortbread into fingers along the score lines. For the biscuits in the photograph above, I rolled the dough into a cylinder (handling it as little as possible), chilled it, then cut coins of dough to place on two greased baking trays and baked the biscuits for about 20 minutes. My maths may not have improved much but I do know that rhubarb is very far from being worthless stuff, particularly when it's Yorkshire Forced Rhubarb.